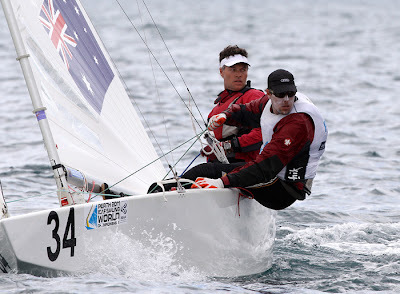 Competition on Day 12 of the Perth 2011 ISAF Sailing World Championships was delayed due to light conditions but once racing got underway top wind speeds of 16 knots in the afternoon kept sailors on their toes. Brazil’s Robert Scheidt and Bruno Prada have extended their overall lead to six points thanks to two good results on Wednesday and their closest competitors failing to place well. Scheidt and Prada got the gun in Race 7, the first for the day, 40 seconds clear and recovered from seventh early in Race 8 to finish third. 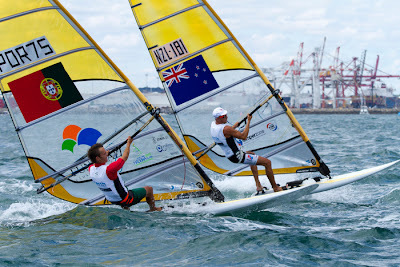 The Brazilians are now on 30 points, six points clear of Mark Mendelblatt and Brian Faith (USA) who are second overall. 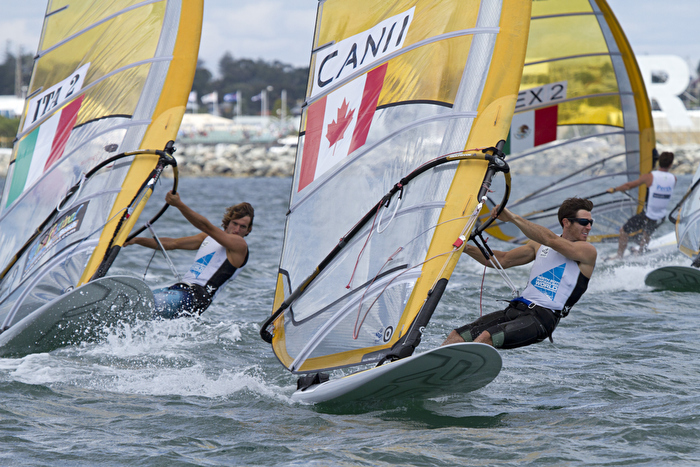 The Star fleet has two races on Friday ahead of Saturday’s Medal Race. Mateusz Kusznierewicz and Dominik Zycki from Poland were ranked second on overall points after Tuesday’s competition, but were forced to quit Wednesday’s first race after receiving a second yellow flag. In third place overall is the German duo, Robert Stanjek and Frithjof Kleen, on 43 points. Dutchman Dorian van Rijsselberghe shares the overall lead with Israel's Nimrod Mashich after light winds plagued Centre Course on Wednesday. It is close at the top however with just two points separating van Rijsselberghe (NED), Mashich (ISR) and Piotr Myszka (POL), who is in third. The Blue and Yellow fleets had one race apiece, leaving van Rjisselberghe and Mashich tied in first place overall while Olympic Games veteran, Joao Rodrigues (POR), just made it into the top ten in 10th place. Light winds of less than 10 knots forced race officials to postpone race 5 in the Yellow fleet for almost an hour. 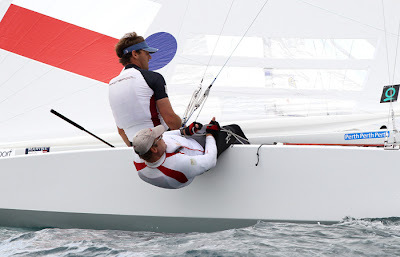 A 70-degree wind shift then forced the race to be abandoned after it had started. 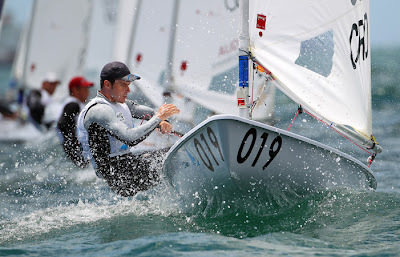 Once racing resumed it was Spain’s Ivan Pastor who took the initial lead with Julien Bontemps (FRA), Jon Paul Tobin (NZL), Nimrod Mashich (ISR) and Joao Rodrigues (POR) following in his wake. But in a sharp changeover, Rodrigues overtook while Andreas Cariolou (CYP) also caught up. The race ended with a win for Rodrigues, with Pastor second and Cariolou third while Tuesday’s favourite Nimrod Mashich (ISR) finished fourth. World number eight and Greece’s only Men’s RS:X competitor, Byron Kokalanis, immediately took charge in the Blue fleet with a clear lead ahead of Myszka (POL) and van Rijsselberghe (NED) in 11 knot winds. But when it seemed as though Koklanis was bound for a win, Shahar Zubari (ISR) proved his world number three ranking, cutting in from the outside to join the leading three.There was a cluster of sailors on the final leg of the race, so much so that it was hard to tell who out of Zubari, van Rijsselberghe, Myszka, Koklanis, Pierre le Coq (FRA) and Elliot Carney (GBR) was leading. But van Rijsselberghe emerged to take first place, closely followed by Myszka in second and Zubari third. Denmark’s Peter Kruger Andersen and Nicolai Thorsell finished Tuesday on top of the fleet, but a capsize in race 7 on Wednesday saw them drop to 15th position overall. New Zealand’s Peter Burling and Blair Tuke came third in race 7 but only managed a 12th in race 8. 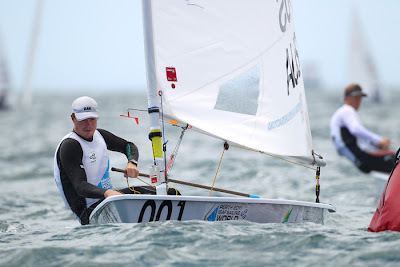 Australia’s Iain Jensen and Nathan Outterridge, ranked first in the world, sailed top 10 finishes to be third overall at end of race 8, the last for the day. The Blue fleet almost didn’t sail Wednesday because of the light wind, but went ahead with a win for Great Britain’s John Pink and Rick Peacock, who finished 40 seconds ahead of Sweden’s Charlie Enlund Ekberg and Kalle Torlen in race 7. Winds crept up to 16 knots towards the end of race 7, but by the time the boats were in sequence for race 8, the water was flat and winds were back down to 12 knots. 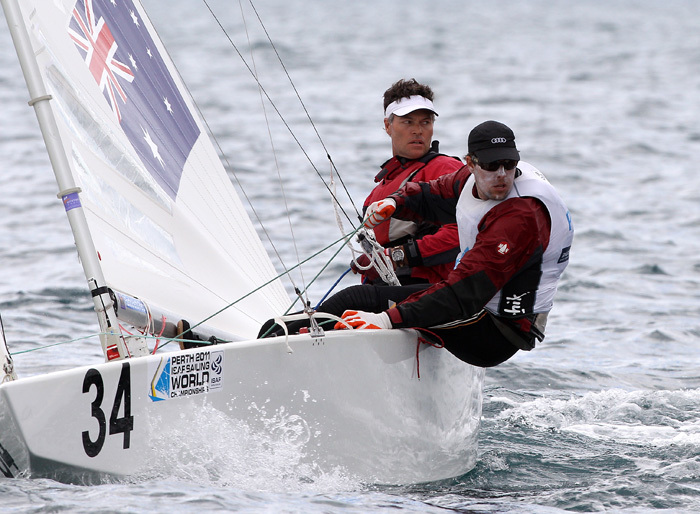 Race 8 finally started around 1700 local time and was won by Australia’s Will and Sam Phillips. Pink and Peacock came in sixth, which was good enough to take top spot overall by four points from Stephane Christidis and Emmanuel Dyen (FRA). 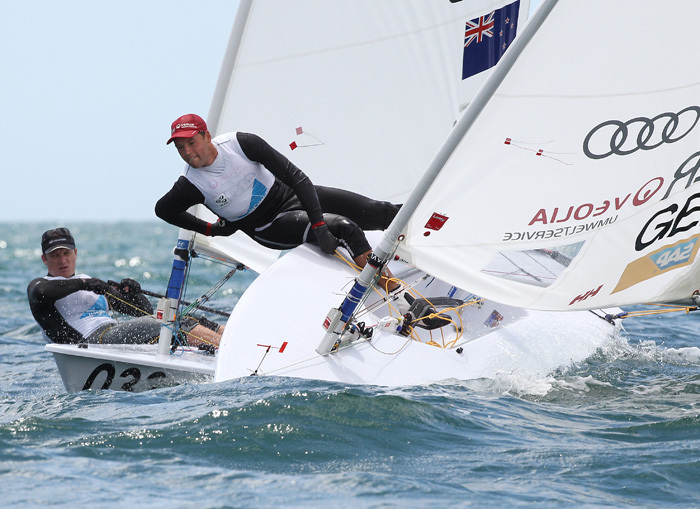 There was one notable rise to fame: French sailors Yann Rocherieux and Mathieu Frei improved their overall standing from 67th position to 14th, thanks to an eighth and a third on Wednesday. 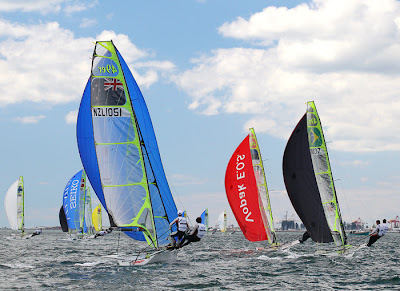 While defending world champion Tom Slingsby (AUS) was setting the pace with his fourth win on the third day of Laser racing, the rest of the field was jockeying for positions in the all-important Gold fleet. Slingsby won and then had a poor ninth when the wind swung from the right to the left, but the ninth is discarded for the moment as he leads the fleet with a net 10 points. Great Britain’s Paul Goodison is seven points in arrears with a sixth and a first on Wednesday to maintain second position, while Germany’s Simon Groteluschen held on to third place with 19 points because of identical finishes to Goodison. 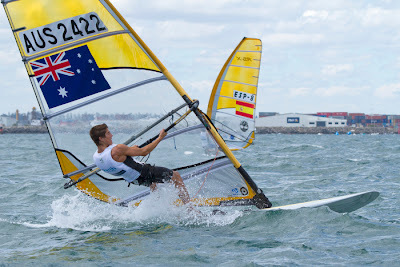 Australian Ashley Brunning moved up six positions to fourth while Austrian Andreas Geritzer was one of the biggest movers of the day, rising 11 places to fifth on the back of a first and a fourth. 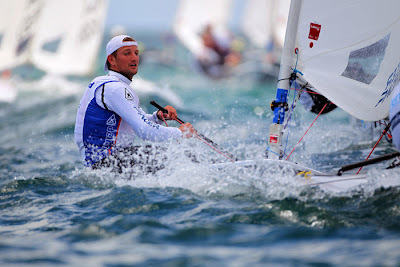 France’s Jean Baptiste Bernaz slipped one position to sixth and Sweden’s Johan Wigforss was also down one to seventh. Both had seconds with a discard. Briton Nick Thompson dropped to eighth from fourth and Croatia’s Tonci Stipanovic lifted five placings to ninth with a pair of fourths. 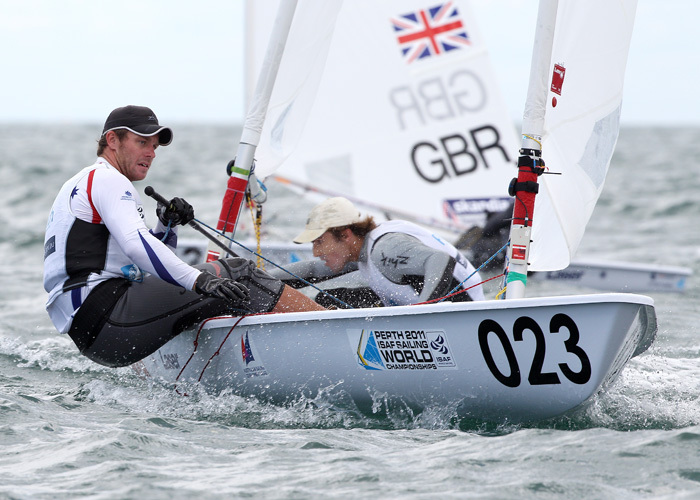 The fleets are now split into Gold, Silver and Bronze with the first races on Thursday, a lay day on Friday and final races on Saturday, ahead of Sunday’s Medal Race. While Races 5 and 6 of the Women’s 470 competition welcomed new faces to the winner’s circle on Wednesday, the fleet’s overall rankings showed little change. Spain’s Tara Pacheco and Berta Betanzos maintained their hold on the number one position, with Japan’s Ai Kondo and Tabata Wakako retaining second place. Gil Cohen and Vered Buskila (ISR) took out first place in Race 5, with the No. 13 ranked duo leading from the start. 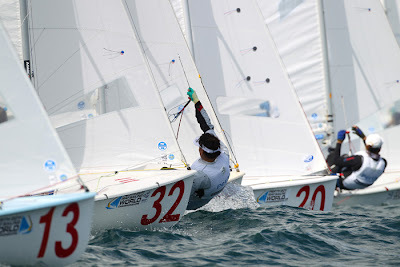 Ai Kondo and Wakako Tabato (JPN) tried hard but were unable to catch up and finished second. The real battle was being fought further back in the field. 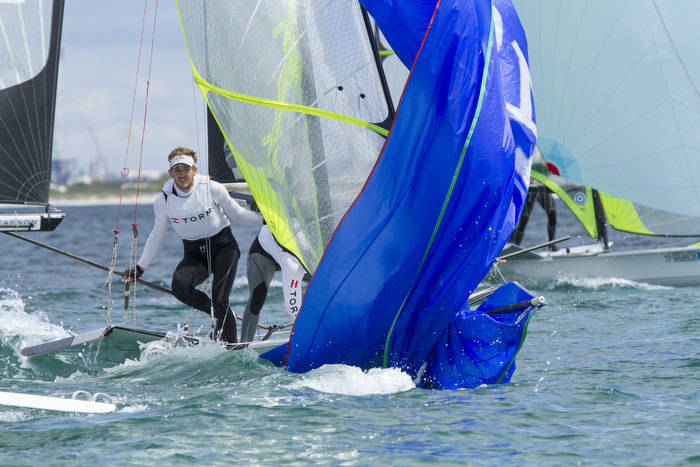 In the hotly contested clash between several boats for third place, Tarp Pacheco and Berta Betanzos (ESP) narrowly beat France’s Ingrid Petitjean and Nadege Douroux. The race was marked with two general recalls and three Black Flag disqualifications. Race 6 was anybody’s game until Jo Aleh and Olivia Powrie (NZL) took the lead at the last mark and held it over the line. 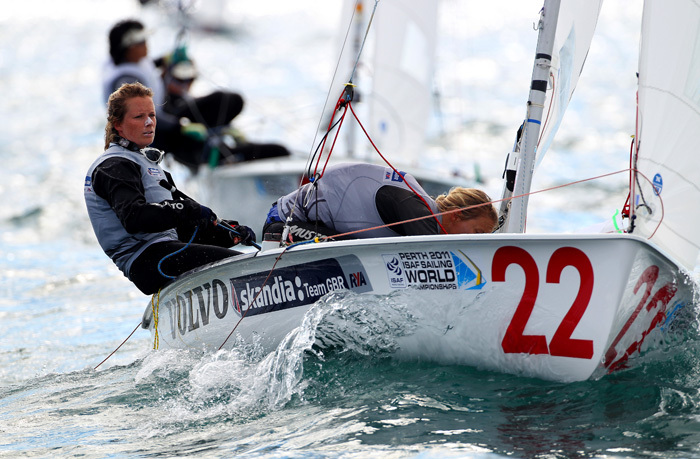 Tina Mrak and Teja Cerne (SLO) were second over the line in Race 6, closely followed by Hannah Mills and Saskia Clark (GBR). The Women’s 470 fleet has a reserve day on Thursday, with races 7 and 8 scheduled for Friday, 16 December. The frustrating wait for a breeze saw a course change from Fremantle's Inner Harbour to open water and better breeze near Rous Head change as competitors fought tooth and nail in the knockout quarterfinals. 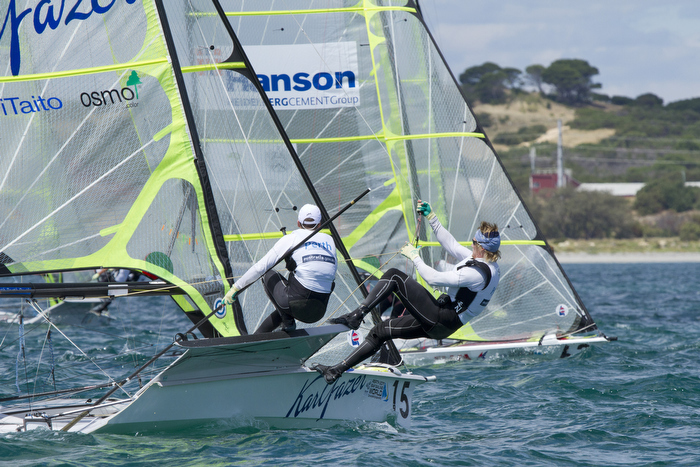 After the four-hour delay, France’s Claire Leroy, Lucy Macgregor (GBR), Russia’s Ekaterina Skudina and Anna Tunnicliffe (USA-1) all skippered their boats to victory in their first two respective matches. The more consistent pressure on the right hand side of the course rewarded those who kept to the favoured side.Leroy (FRA-1) dominated Sweden’s Anna Kjellberg (SWE-1) in the opening match of Flight 91, Great Britain’s Macgregor had little trouble against Mandy Mulder (NED-1), Skudina (RUS) held off Australia’s Olivia Price in AUS-2 and Tunnicliffe took victory over Nicky Souter in AUS-1. A second win to each of the winning boats in the second flight of the day, put the pressure and excitement on Flight 93 with Kjellberg (SWE), Mulder (NED-1), Price (AUS-2) and Souter (AUS-1) needing to win to keep their semi-final hopes alive. Kjellberg (SWE) gave it everything against Leroy (FRA-1) from the prestart, maintaining her lead well downwind and rounding the leeward mark ahead. The Swedish skipper was still within attacking distance as Leroy rounded the last mark in front. With the two boats bow to bow heading for the finish line, Leroy managed to cross first to secure her place in Thursday’s semi-final. With her World Championship title hopes on the line, Netherlands skipper Mandy Mulder pounced on Lucy Macgregor’s lead as the British skipper struggled with her spinnaker. With Macgregor then picking up a penalty, Mulder crossed the finish line for her first victory. Despite starting in good pressure, Olivia Price (AUS-2) was unable to hold off her Russian opponent, with Skudina notching up her third victory to progress through to the semi-final. Nicky Souter briefly kept Australia’s title hopes alive, making things difficult for Anna Tunnicliffe after USA-1 picked up a penalty early on. But the world number one skipper didn't let the penalty phase her and grabbed the lead to notch up her third win of the day. 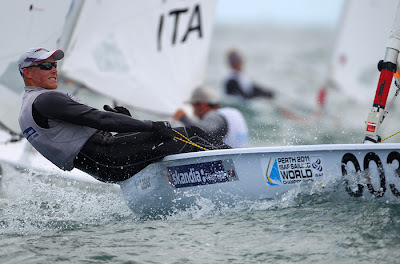 With just one semi-final place remaining Mandy Mulder (NED-1) and Lucy Macgregor (GBR) were the only two boats racing in Flight 94, their fourth match up for the day. Macgregor crossed ahead of Mulder early, covering her loosely on the second windward leg. Despite carrying some nice pressure down the course, Mulder couldn’t get in front, making Macgregor the fourth and final boat through to the semis. The knockout quarterfinal format saw four head-to-head matches between eight boats in the best of five flights. The first to claim three wins progressed through to the semi-finals. 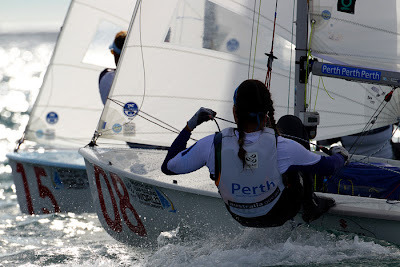 Women’s Match Racing is scheduled to move from the harbour to the Centre course on Thursday from 1200 local time.